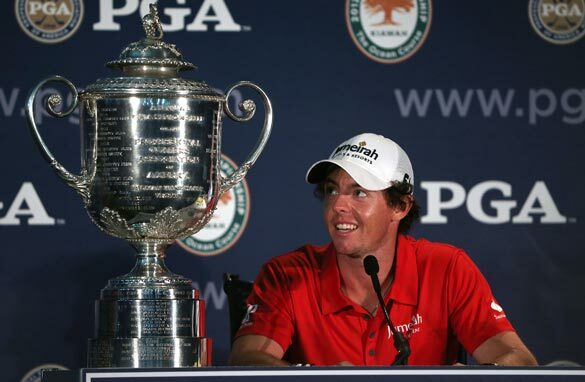 PGA champion McIlroy to follow in Tiger's footsteps? Two major championship wins at 23 years of age: Rory McIlroy’s validation as a world-class golfer continues to grow and grow. He has become the sixth youngest multiple major winner in history, and how timely that he pushes Tiger Woods to seventh on that list, eclipsing him by a mere five months. McIlroy is not targeting Woods' records however and is emphatic when discussing his own potential to carve out a distinguished career: “I mean, I've won my second major at the same age as he had. But he went on that incredible run like 2000, 2001, 2002 and won so many. He talks about winning his third major and, given his ability to tame Augusta National like he did for 54 holes last year, it could conceivably come at the Masters in eight months time. He’ll still be only 23. There isn’t a major that he isn’t capable of winning and he’s led all four at some stage in the last two years, winning two. No other golfer of McIlroy’s vintage is coming remotely near this level of performance on a regular basis. Comparisons with Woods are inevitable, but McIlroy prefers to do it his way. It’s worth noting McIlroy had a longer apprenticeship in the pro ranks before winning his first major, turning pro at 18 and winning the U.S. Open at 22. Woods turned pro a couple of months before his 21st birthday and a mere four months after getting the key to the door, he was wearing a green jacket. Also worth noting is that Woods completely overhauled his swing after winning the Masters in 1997, therefore he didn't claim his second major title until he was 23. Woods has 14 majors right now and is the greatest player of the modern era. McIlroy respectfully acknowledges this but is clearly on his own mission towards greatness. He continues to improve on so many levels, but the addition of a second major success at such a young age can only propel him to further heights. After winning the Honda Classic in March, McIlroy jumped to No. 1 in the world rankings. It was another peak scaled, yet his performances in the subsequent major championships were subjected to intense scrutiny by the golfing media, citing his love affair with Danish tennis star Caroline Wozniacki as a cause for his sudden lethargy on the golf course. Four missed cuts in five tournaments was certainly out of character, but they also served to alert McIlroy to the need to work harder on his game and prioritize his time. Timing is everything and for McIlroy, the endless hours of work with coach Michael Bannon throughout the summer has paid off. They couldn’t have timed it better. McIlroy seized the moment at Kiawah Island and showed remarkable maturity and guile, on a brutally tough golf course with the world’s best in attendance, to take control of the tournament in the third round before marching to a record-breaking eight shot victory at the final major of the year. It was a game changing performance in South Carolina as McIlroy separated himself from his peers and dominated the field with a breathless display of shot making. Fittingly, one of his main sponsors is a sunglass manufacturer. The future is so bright for McIlroy, he really does have to wear shades. Shane O’Donoghue joined CNN in 2011 as the host of monthly programme, ‘Living Golf’. Hailing from Tipperary in Ireland, Shane worked as a presenter and commentator for the national broadcaster RTE for fifteen years. From 2004-2010, he was part of the BBC TV Golf Commentary team, reporting, commentating and interviewing at key events such as The Masters, Open Championships, BMW PGA Championships, Barclays Scottish Open Championships in addition to the Ryder and Walker Cups. For CNN, he was the first journalist to interview Tiger Woods and Rory McIlroy together. A fine player himself, Shane regularly takes on the pros on behalf of CNN Living Golf. He has a particular passion for the amateur game, and has written a book called, “Legends in their Spare Time”, about Ireland’s finest amateur players.